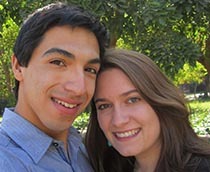 Megan met Juan while studying abroad in Chile. They were married in July 2015. Several weeks ago I was talking about wedding planning with one of my college friends (who is also going to be one of my bridesmaids). She and her husband got married last September, so I thought that having already gone through the whole process herself, she might be able to give me some good advice. It’s a good piece of advice, and one I’ve been thinking about a lot these last few days. Just this past weekend my Mom called to tell me that she had heard from a friend who saw on Facebook that the venue we had booked for the reception is closing. We were taken completely off guard, having received no notification of this whatsoever from the venue itself. After confirming the news, we had to try to find a new venue, five short months before the wedding. We’re getting married right in the middle of the summer so this is not an easy task. Most of the venues have been booked for months. As you can imagine, this was rather upsetting, especially because we had specifically planned a morning wedding with the idea that the reception would have natural lighting and a great view of the gardens just outside our (now nonexistent) reception hall’s windows. Juan and I are both outdoorsy; we love running outside, biking, and hiking together, and we both feel close to God when appreciating His beautiful creation. We wanted to incorporate that as much as possible into our reception, and had found the “perfect” reception hall, with beautiful gardens just outside the banquet area, so our guests could wander around if they felt so inclined, and during the entire reception, the hall would be lit with natural light. “Perfect,” except now it’s closed. The day after we found out about this, Juan came to meet me at the language institute where I work. Back in Wisconsin, my parents were calling literally every reception venue they could think of without much luck, and while I was teaching, Juan was googling reception sites to call later. When I finally finished work and we headed back to my apartment for dinner, it would be an understatement to say that I was stressed out. At this point we had found no options for an alternative venue. In that moment I realized that, in all this drama, I had possibly lost sight of what is really important here. Juan and I are getting married. That’s what will make the day perfect for us, no matter what happens. At the end of the day, Juan and I will be a new family and a new expression of God’s love in the world. We get to start our crazy amazing adventure, our life-long quest for holiness side by side till death do us part. That is beautiful and that is perfect. So for Lent this year, I’m giving up my “perfect” reception and going to spend time planning the wedding Mass with Juan, choosing the readings and the music, writing the petitions, and going to marriage prep classes in Santiago. I’m going to spend my time being thankful for the goodness of God, for my Catholic faith, my amazing fiancé, my parents who care enough about Juan and meto give up an entire weekend trying to find new reception venues, and for my amazing family and friends whose presence is going to make the reception awesome no matter where it is. As for the reception hall, I’m sure something will work out.